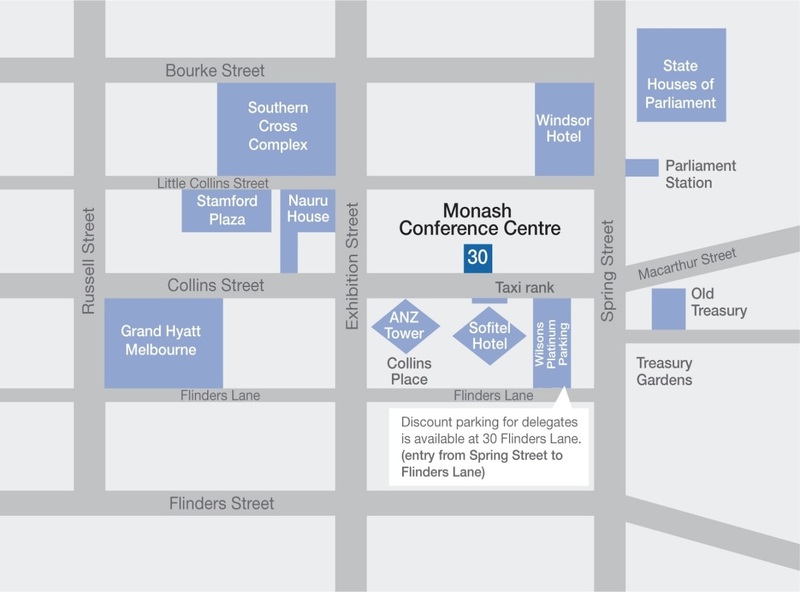 Located at the Paris end of Collins Street, the Monash Conference Centre is within easy walking distance to a number of car parks, trains, trams, buses and a taxi rank. It is also only a short stroll from a wide variety of hotels and accommodation options. Parliament Station is located on Spring Street and is only a two minute walk from the Monash Conference Centre. Tram Stop number 9 is on Collins Street at the intersection of Spring Street. It services tram numbers 11, 42, 48, 109 and 112. Discount Parking is available at Wilsons Collins Place Car Park located at 28 Flinders Lane and is part of the Collins Place Complex underneath the Sofitel Hotel. Entry is via Flinders Lane from Spring Street. Please note it is the second car park on the right hand side. No discount is applicable if delegates park in the first car park which is Secure parking. To receive the discounted rate delegates can present their parking ticket to staff for validation. The Conference Centre is centrally located to a wide variety of accommodation options and has discount rates with several hotels within the city centre for groups over 10 rooms. Alternatively you could try Trip Advisor, Hotels.com and Trivago.com. If you are looking for a quick bite, coffee, lunch, a special dinner or just beautiful spot for a drink, stay close to the Monash Conference Centre and experience Melbourne from the top end of Collins Street as locals do and spend less time walking and more time enjoying. Click here for Broadsheet to search Cafes, Bars and Restaurants for a drink or bite afterwards.